Along side of today's iPad 2 event, Apple released iTunes 10.2 for Mac OS X and Windows PC, and previewed iOS 4.3, which will be released on March 11 also. In iOS 4.3, Apple has added incremental improvements to Safari and AirPlay. Apple also baked in iTunes Home Sharing, iPad Side Switch (formerly known as the orientation lock switch and mute switch) preference setting, and, for the iPhone 4, the Personal Hotspot. 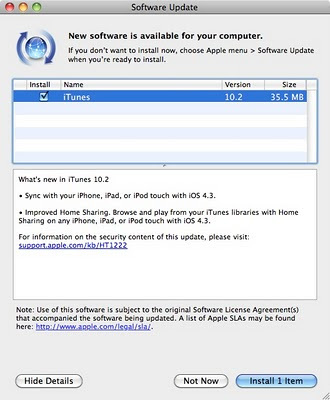 iOS 4.3 will be available for current model iPhone, iPad, and iPod touch models. While reading the Apple website for details on iOS 4.3, the second generation AppleTV was not mentioned, however, I expect that device to also receive an update before too long. 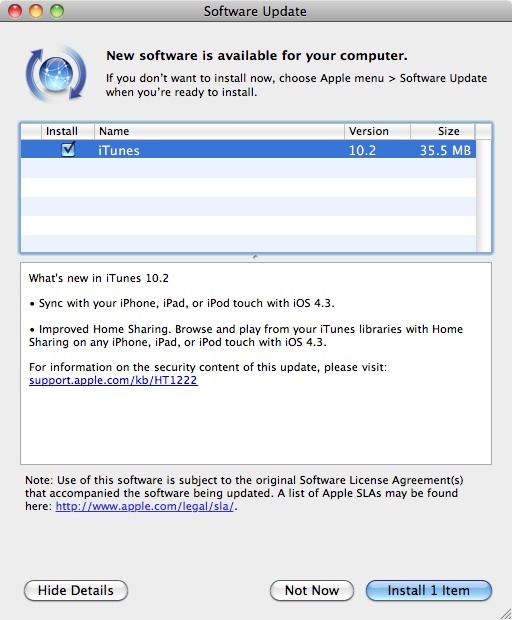 iTunes was updated to 10.2 today to bring support to Macs and Windows PCs for the new iOS 4.3 features, and probably support for the iPad 2, however, the iPad 2 was not specifically mentioned in the update description. iTunes 10.2 can be downloaded now via the Software Update control panel on your Mac or PC. Check out all the details over at Apple.com. This is a useful update for the phone. You need to install it properly though.